We are excited to host the AST Club Fair next Monday from 2:30 - 3:35 p.m. in the gym. It will be the first time that we open the Club Fair to the whole school, allowing the elementary students to be part of the excitement and to join the groups as a community! We have had many students who have come forward with ideas and areas of interest, such as fencing, soccer, guitar jam sessions and many more. It is a great enriching activity for all. An AST club is a truly student-centered organization. The students are the driving force of the clubs, and the teachers and coaches act as a support in guiding them to reach their goals. These clubs allow students to develop their talents, as well as help to shape their leadership and interpersonal skills that will last for a lifetime. We even have alumni who have come back to continue to work on a project from last year, or are sharing their college life stories with the juniors and seniors. MS/HS clubs will officially start on August 20. If you have any questions about MS/HS clubs please contact Mr. Ethan Dombkowski and Patrick Herding. Please contact Ms. Amber Chin regarding ES Clubs. 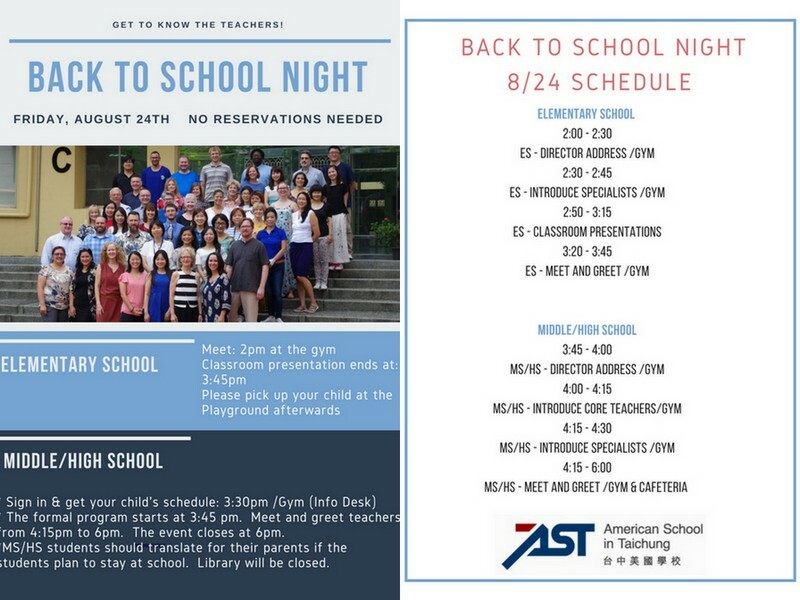 Another exciting event that is happening next week is Back to School Night! We are taking a different approach this year where the focus is “Getting to Know Your Teachers”! Parents will have an opportunity to meet and greet their child’s teachers in a more personal way to develop direct communication from the beginning of the school year. They will also receive important information about the academic programs. We strongly believe parents and teachers are partners in a child’s education and invite you in to get to know each other! The elementary program will start at 2 p.m. in the gym. Following the director’s address and the specialists introductions, the classroom presentations will take place in the elementary classrooms. The program will end in the gym with parents and specialist teachers getting to know each other. . The middle/high school program will start at 3:45 p.m. with the Director’s address in the gym. Afterwards, parents will then be able to visit teachers’ tables in the gym or in the cafeteria from 4:15 p.m. to 6 p.m.
We hope parents and teachers will feel more comfortable reaching out to each other as needed, developing a closer working relationship for the benefit of our children. For more information, please see our schedule below.